If you didn’t know I’m off to Melbourne on Friday. I’ll be putting on my big girl pants and heading interstate (all alone) for the Kidspot Voices of 2014 final hurrah and I can’t wait! I’m not much of a traveller (sadly) so I get a little nervous whenever I do travel, but I think it’s because I’m the type of person who is certain she’ll forget something. This is why I’ve already started packing for my mini weekend away. You can never be too prepared, but I’ll be travelling light so if I do end up shopping (of course I will) I’ll have room in my suitcase for all my new goodies! Here are a few of my carry on essentials. Yes, my earphones are pink. Didn’t you hear white iPhone earphones are so five years ago? Hahaha. I pretty much always carry my earphones around with me for those downtime moments, and I will not be forgetting them for this flight (yes, it’s happened in the past). Music is one thing that keeps me sane when flying, and I’m hoping if I choose the right tunes it’ll put me to sleep too. Suggestions? I’m loving anything by Dustin Tebbutt, Kaleo’s “All The Pretty Girls” and Thelma Plum. Don’t tell me you can sleep on a plane without an eye mask? To be honest I even wear it at home to block out the light of the TV. I couldn’t go past this super sweet floral print (similar here), and I’m sure I’ll get a few interesting looks on the plane with this beauty on my face, but as long as I can block it all out I’ll be the one smiling! I’m paranoid I won’t fall asleep on my flight so of course I’ll be bringing a book with me. 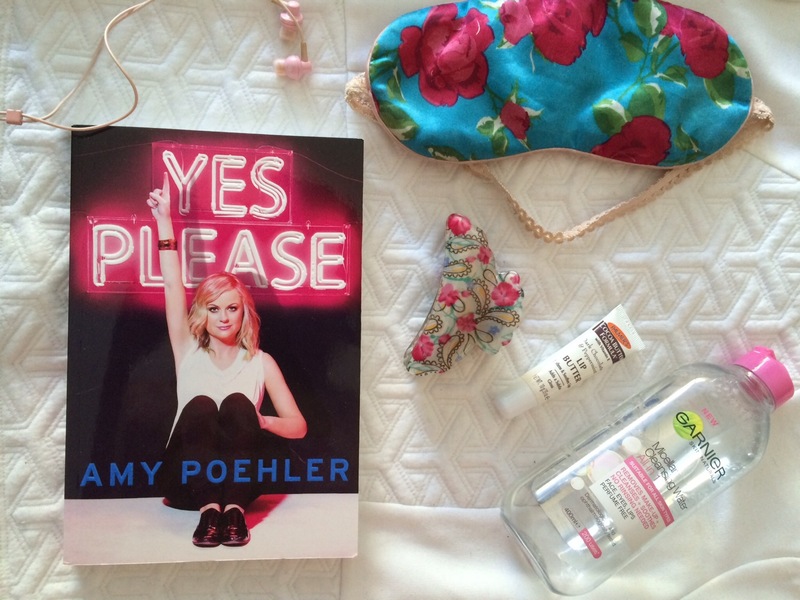 Amy Poehler is hilarious and this book must be a goodie if E finished it in a day! One thing I do love about flying is I’m forced to stay away from social media for an extended period of time so it’ll be so nice to kick back and relax with a good read. I plan on freshly washing my hair before I leave on Friday, so to avoid tying it up in a hair tie and risking that pony tail kink I love a good claw clip to keep my hair at bay without destroying it. This pretty clip was under $5 at Priceline and I couldn’t pass up the sweet print. And I know I’ll be thanking myself when it’s time to get ready for the event when my hair is easier to style. The reason I adore this lip balm is because it smells exactly like real chocolate. So instead of snacking on sweets I just apply this cocoa butter formula on my lips and cravings be gone. My lips and skin dry out very quickly when flying so this lip balm will be my go to for keeping my lips on point post flight. Cats out the bag, I truly do love micellar water. I even wrote a diary entry about how much I adore the stuff a few months back. It’s one of those all in one products that you can carry with you instead of bringing five different ones. It removes make up, cleanses and soothes without having to wash it off. Perfection much. Keep your eyes peeled at the blog in the coming weeks for all my Melbourne adventures. I’ll definitely be in tourist mode on my holiday. What are your travel essentials? Anything I’ve forgotten? Enjoy your time in Melbourne!!! Great list too, mine’s pretty similar – iPod and headphones, spare hair tie, lip balm, book… I also can’t go without a journal and pen, and a small bag of peanut M&Ms! I’m totally intrigued about this Garnier water business though! Get on the micellar water Jess, it is seriously heaven in a bottle! Hahaha, peanut m&m’s are definately an essential item too hahahaha! That cleansing water is the best, I love it so much! I always take a super light moisturiser that I can use on my face, hands and arms, as the plane air dries everything out. The most important thing on your list is the lip balm. You don’t want ‘dagger lips’ when you land (which is what happened to me once after a longggggggggggggg flight) so balm those lips !! And have fun, can’t wait to find out about the wind up of the Voices of 2014. Aww thanks Annie. Floral anything for me! Hope you have a wonderful trip, I love the eye mask and definitely want to try that lip balm out! Thanks Lila! I’m still packing at this moment in time. Hahaah. Procrastination at its finest! Enjoy your trip! That lip balm sounds delicious! Cheers Becky! It truly is yummy!